Introduces a new approach to rock mechanics called ``block theory,'' which formalizes procedures for selecting proper shapes and orientations for excavations in hard jointed rock. Applies block theory to rock slopes and underground excavations, and covers the Q theory of rock classification, the empirical criterion of joint shear strength, rock bolting, properties of weak rocks, statistical frequency of jointing, an empirical criterion of rock strength, and design of underground supports. Contains many new problems with worked-out solutions. 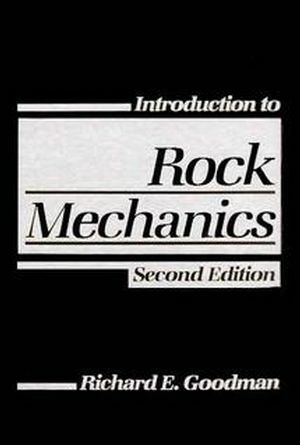 Richard E. Goodman is the author of Introduction to Rock Mechanics, 2nd Edition, published by Wiley. Classification and Index Properties of Rocks. Rock Strength and Failure Criteria. Initial Stresses in Rocks and Their Measurement. Planes of Weakness in Rocks. Applications of Rock Mechanics in Engineering for UndergroundOpenings. Applications of Rock Mechanics to Rock Slope Engineering. Applications of Rock Mechanics to Foundation Engineering.